Check-in from 3.00pm check-out by 10.00am. Payments are by Bank Transfer or Paypal and can be paid either in full or in instalments. A £100 deposit is required to secure your booking, this is in addition to the hire price & will be held as a damage/security bond. Your deposit/bond will be returned to you within 48 hours of your departure. 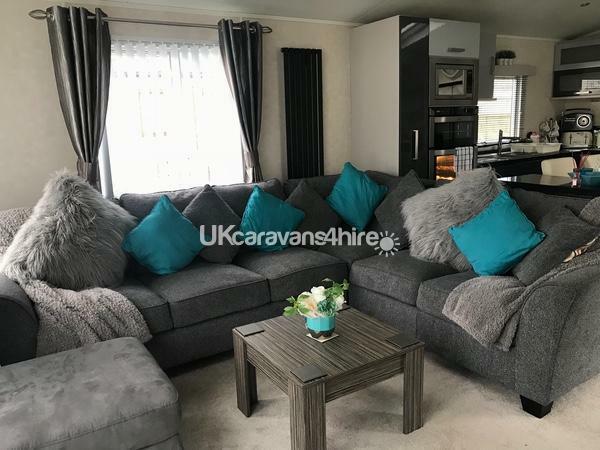 We ask that you leave the caravan clean & tidy as you found it on arrival. 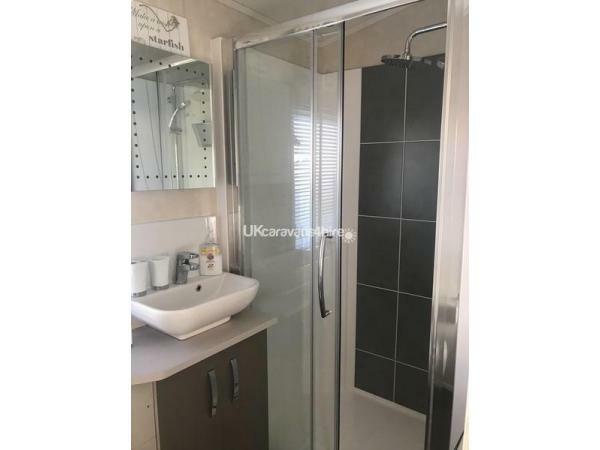 Modern platinum 2 bedroom, Carnaby Envoy that is 42ft by 14ft. 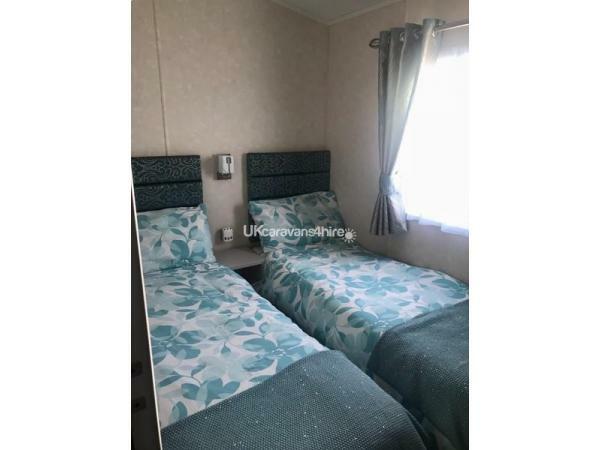 Our caravan is beautifully decorated with double glazed and central heating. 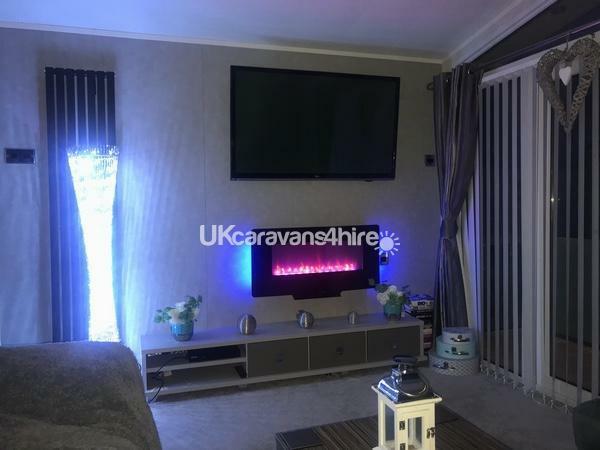 The lounge has a lovely luxury suite, matching buffet, display cabinets underneath a wall mounted 50 inch flat screen TV, Blu-ray player, colour changing electric wall fire. 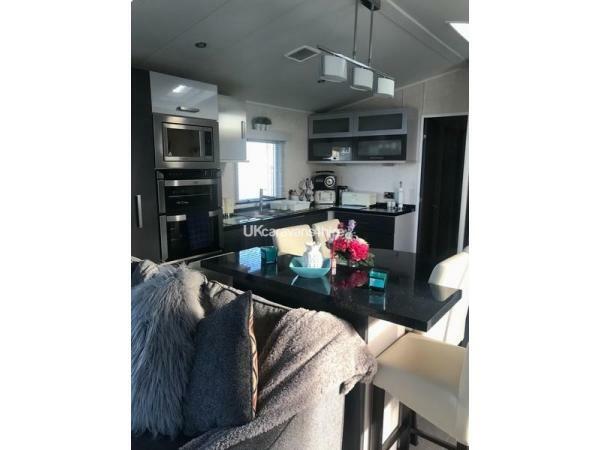 The kitchen is open plan which flows to the lounge, it is fully equipped - microwave, American style fridge freezer with water dispenser, free standing ironing board and iron, Dishwasher, Actifry and sandwich maker. The dining area has a large window and sky light which gives a more light. 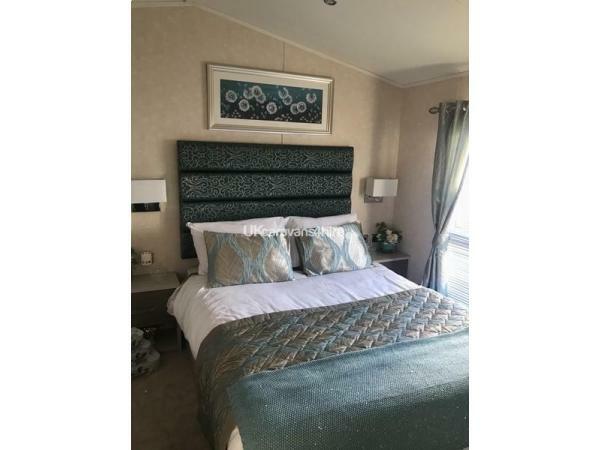 Main bedroom has a double bed with lamps above and at the side of the bed, walk-in wardrobe, drawers either side of the bed and in the wardrobe & en-suite shower room, wall mounted tv. 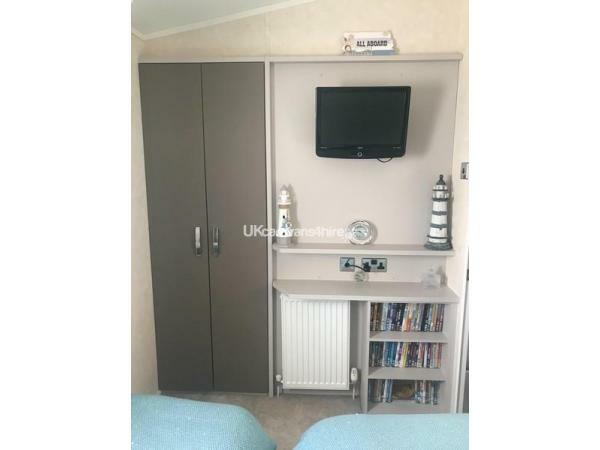 The twin bedroom has 2 full size single beds wardrobe, bedside cabinet, TV and DVD combo, All mattresses & pillows have protectors fitted, all duvets & pillows are provided. 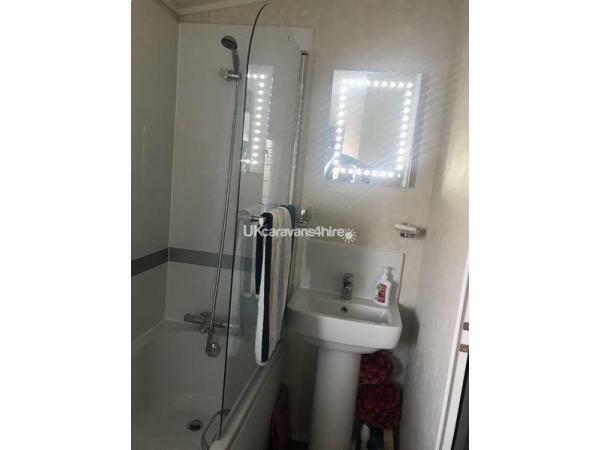 Main bathroom has a bath, shower over the bath, wash basin, storage cupboard & WC and also a heated towel rail. 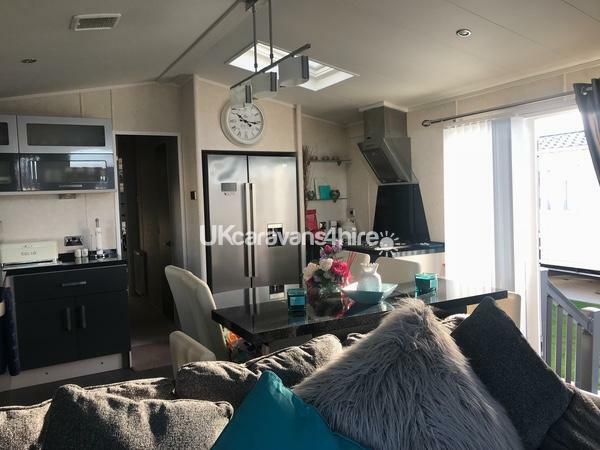 We provide a hair-dryer, vacuum & cleaning products, our caravan is immaculate & is cleaned & maintained to a very high standard. 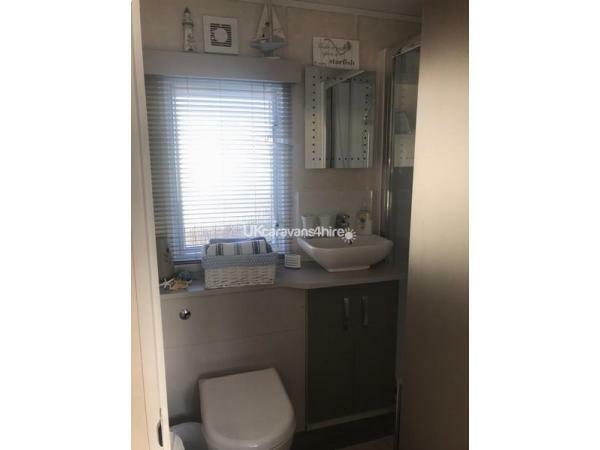 Situated on the new lovely Merlin plot on the side rows of Edwards Caravan Park in Towyn North Wales, on site we have a shop, chip shop & laundrette. The beach is just a few of minutes walk away from the caravan park. Perfectly located close to Knightlys fun fair, on site chip shop/takeaway, shops, gift shops & markets including the large Tir Prince Market and fun fair, family friendly pubs, clubs, restaurants, arcades & go-karts. Plenty of food places & takeaways some will deliver your to your caravan. We provide all clean fresh bedding and towels during your stay. Strictly No Smoking & NO pets.